We made a major effort to get Northeastern to change their site plan so the new buildings don’t loom over the park. In fact, we were quite shrill and impassioned in our defense of the park. However, other than getting Northeastern to promise to plant some trees to block the view of the building, we acheived little. Since that time we have turned our attention to the positive aspects of the park, the vast amount of life that is supported by this pesticide free land of meadows, forests, and wetlands. We are doing what we can to encourage The Trustees (of Reservations) to continue their efforts to raise the funds they feel they need to manage the park. And we continue to ponder what our role will be if they succeed and become park managers. And what happens if they don’t. These are topics for another time. But we felt that after raising the alarm as loudly as we did, we should report back how the new Building 5 is coming along, and how it seems to impact Central Field. 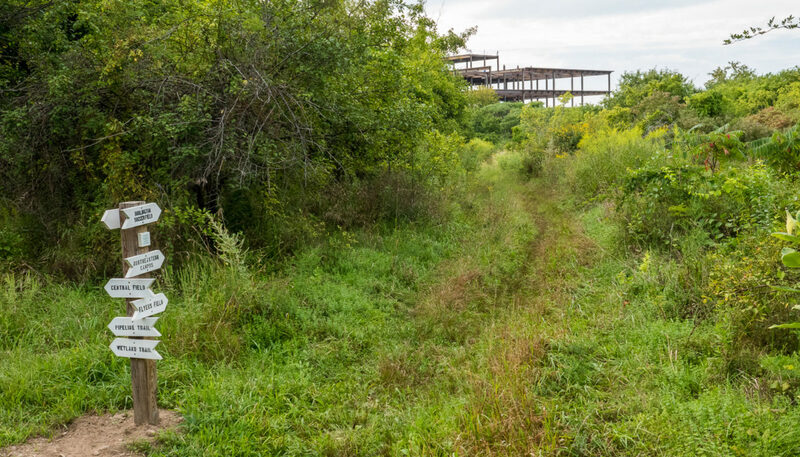 Above is the view of the building from the upper part of Central Field, as you would see it upon entering Central Field from Whispering Hill Woods. It is not a pretty sight, and it does loom over park, pretty much exactly as we said it would. It is not visible from much of Central Field – at least in the height of summer. What will happen when the leaves come down remains to be seen. And assuming that Northeastern does plant the promised trees, and assuming that they grow to a reasonable height, and assuming that some of them are evergreens, the buildings might not be as much of a blight on Central Field and Mary Cummings Park as we feared. Lots of assuming. The Friends of Mary Cummings Park was quite torn apart by the creation of the Burlington Soccer field on Blanchard Road. It converted a potentially rich meadow into a monoculture of grass. But it also provided safe parking for the first time, many new visitors, and greater park awareness. So we recognize that much good came with the bad. Will there be a positive side the the massive new buildings at Northeastern? Hard to say. It depends largely on the promised tree barrier, and how Northeastern handles it’s new relationship to the park. If they make their campus into a new and well-marked park entrance with parking, that would be a positive. But we also recognize that they have advertised the park as having a military degree of security (when speaking to the military who are supporting much of the new research). So we tend to think that there may be no public access to the park from Northeastern in the future. Their people may be able to walk into the park, but how would they prevent other park walkers from entering the military-safe campus? Would they post a guard at the gate? Doubtful. Time will tell how the new Northeastern Campus, giant drone research cage, 104,000 square foot research building, and other developments will affect the park. We will be watchful, though recent history suggests there may not too much we can do to alter the course of things. Nevertheless, we will defend the park in any way we can, and ask for your support along the way.